Amazing overhanging hand crack and stemming for 60 feet and then 130 feet of great dike climbing. Use slings to reduce rope drag. 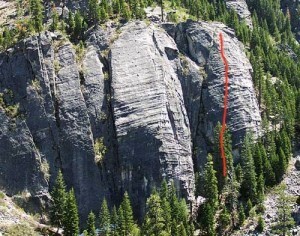 You can climb this route in two pitches but it’s better to climb one glorious 190-foot pitch. Because the pitch is so long, use slings to manage rope drag. You get bolts at the hard moves and bolts every 10-15 feet on the easier terrain. A final 5.6 R pitch to the top is not recommended. Rappel to descend with two 60m ropes or traverse right to The Groove bolt anchor. Rappel from there with one 60m rope or continue to the top. Which SuperTopo guidebooks include a topo for Sinbad-Herbert? A view from the Hogsback.